This haunting story of a young woman's first experience of love carries deep wisdom for girls and women of all ages. From the strange flow of time in fairyland, to the association of fairies with the dead, the story explores several fascinating aspects of traditional British fairy folklore. It is beautifully shot in the magical landscapes of Cornwall and the Dartmoor National Park, and as well as the 38 minute film, there is a fun little bonus movie: Behind the Scenes. 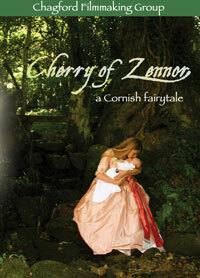 Suitability: Cherry of Zennor is an important story for girls and age nine and above. The DVD is in PAL format. Our American friends will need a multi-region DVD player or a computer to play it. £10.00 UK sales including postage. £12.00 for anywhere else in the world. "Absolutely stunning and brilliant; the cinematography crisp and beautiful." - Ellen Kushner, American writer and winner of the World Fantasy Award for her novel Thomas the Rhymer.